The Union City Greyhounds played in the KItty League from 1935-55 when the league ceased to operate. The last three years they were known as the Dodgers and were a class D farm club of the Brooklyn Dodgers. Other major league affiliations were with the St. Louis Cardinals. Cincinnati Reds, and the Cleveland Indians. If you have materials or memories involving the Union City team, former players, Turner Field,or the Kitty League, you would like to share, email me below. A season league pass signed by Kitty League President Shelby Peace of Hopkinsville was given to Union City Greyhound club officer, Dave Knox for the 1942 league season. 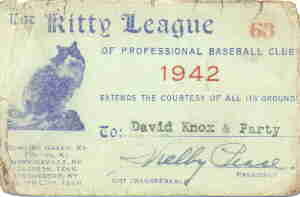 Mr. Knox only got to use the pass until late June when the league was disbanded because of WWII. It restarted in 1946. Goodbye to the Greyhounds, and umpires so mean. As the Hounds take the field to carry on the fight. As we remember guys like Hutson, Petschow, and Ladd. As Neuman swings and the ball takes a ride. The Greyhounds uniform no longer are worn. The grandstand screen is starting to rust. All the Jaycees could count was fifty-one. Nevertheless the citizens rallied in time to save the team and it continued until the league stopped play after the 1955 season. Kharacters in the Kitty These were orginally published in The Bullpen-a newsletter about the Kitty League published by Kevin McCann. 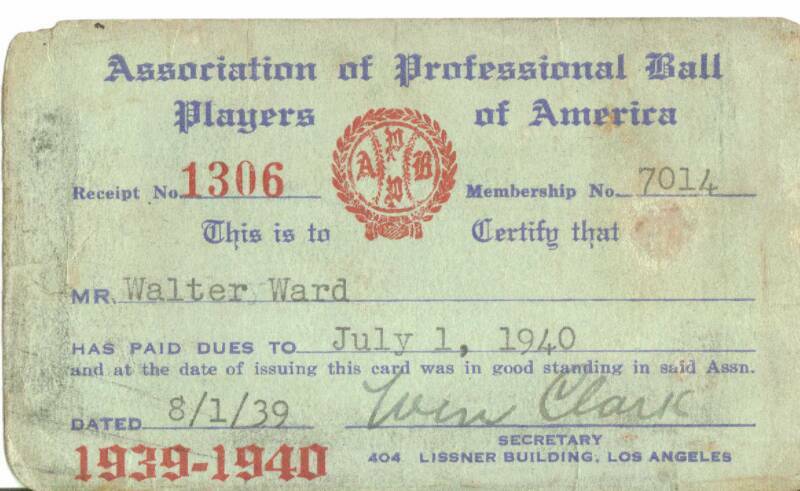 This membership card in the Association of Professional Ball Players of America was recently found by 88 year old Walt Ward. The association was founded to fight the "reserved clause" in all contracts. Greyhounds. Original music from 1952. View the 1937 autographed baseball.